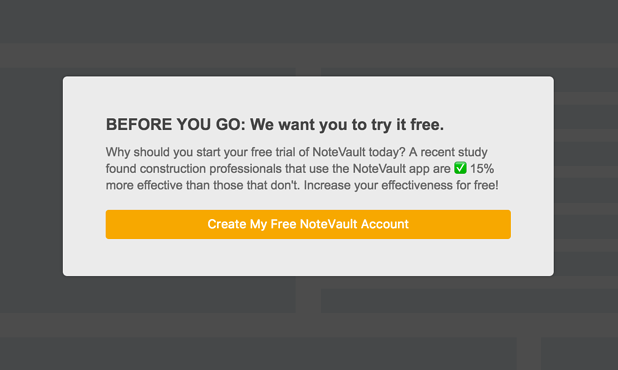 Back in March 2016 (Q1) NoteVault, a construction software startup out of San Diego, CA, was investing heavily in marketing. Focused on scalable growth and providing their customer with the best product available for daily reporting, they were attending events around the world, (and increasing overall spend) to obtain the growth goals they had set for themselves. Growth and potential was exponential, and their investment partners were excited. 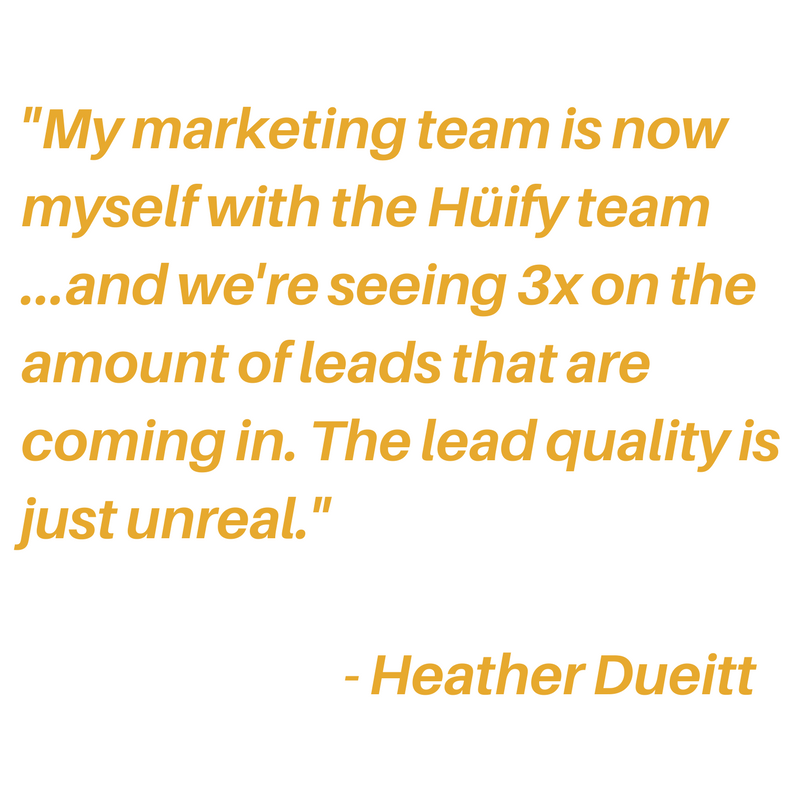 When Heather Dueitt was hired as Director of Marketing, she took the initiative to provide success metrics to inform her marketing strategy, as well as to remain transparent with key stakeholders. As she dug deeper into data, she realized that most of the information that the marketing department had been measuring their success on was inaccurate. At that point, the marketing department at NoteVault still relied on legacy strategies. This is no surprise, as the construction industry is, comparatively, one of the least digitized sectors––second only to agriculture. In retrospect, the inconsistent data prevented NoteVault from having a better understanding of their marketing efforts. Meanwhile, the bounce rate on the NoteVault website had reached an all time high, at around 80%. Due to the low return on investment and incrementally high marketing spend, NoteVault decided to make some changes. The marketing budget was significantly reduced and the marketing team was restructured. Now with just a team of two, Heather, along with Chief Revenue Officer John Roshala were responsible for providing new strategies and tactics to show the true value of marketing. Given the choice to hire more team members, or to invest in an agency, Heather and John chose the latter. Having experience in an agency herself, Heather knew that it was the best way to make improvements, fast. They vetted multiple partners before deciding on Huify. Attributing the choice to our ability to ask the right questions (the transparent ones that cause you to really think about what you’re doing and why), they had no doubt that we were focused on providing measurable and actionable tactics––something NoteVault definitely needed. After Hüify was brought on board, we continued the conversation from the sales process to identify the immediate challenges she was facing at the company. 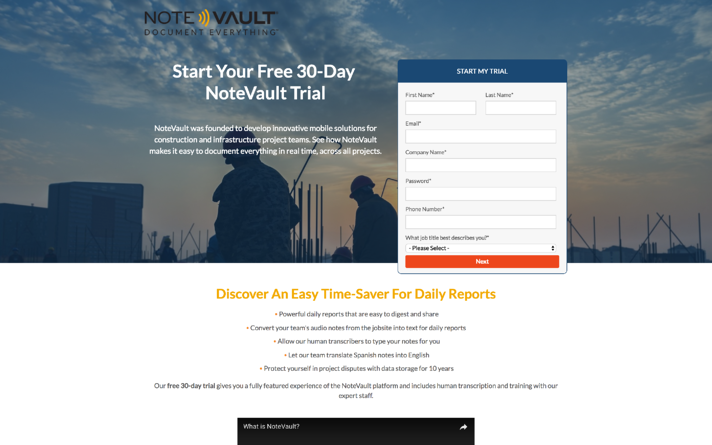 This included not having a consistent way to track signups, or gain high quality leads, from their 30-Day Free Trial of the NoteVault construction software. Our team knew we had to provide value quickly. To show NoteVault where improvement was needed, we used the funnel analysis to explain the logic behind our strategy, and let the data do the talking. We determined that we needed content marketing, new goals, and a way to measure it all. During our first conversations with Heather, we began to see where the gaps were. When outlining our goals, we wouldn’t use any type of marketing bandaid. Instead, we focused on building a structure for success. For starters, we identified an opportunity to clarifying the messaging and improve the look of the home page and landing pages. To start, we outlined some very achievable goals and action items. We set these goals before taking any action. Although there were a lot of things we could have done, but we knew that we needed to show value right away. When NoteVault came to us, they had recently had their website redesigned and built on the HubSpot COS...though it became apparent (with the consultation of HubSpot’s team) that best practices and a growth driven design mentality had not been used. All of these changes were designed to be compliant with inbound best practices using strategies we know increase conversions. Even with simple growth driven design updates, the website began to perform better, with a decreased bounce rate and higher conversions. Often with content, the first solution is to build out new campaigns with new content assets. This is great, but it also takes time. During our onboarding process, we focus on not only building the foundation for future content (buyer personas, campaign plans, keyword research, etc.) but also on identifying quick wins. So we looked to where the most people often forget––existing content. NoteVault’s blog was very built out with content being published frequently and was performing well, but needed updating based on SEO and blogging best practices. The result? 71% increase in organic traffic and current, well-performing content working for us with little-to-no effort. Along with historically optimizing existing blog content, we focused on the next quick win––utilized existing and new content assets to engage contacts at all stages of the funnel. NoteVault had a few solid ebooks and whitepapers that contacts were downloading, but weren’t providing any information to access them (aka, non-gated assets). With a new optimized landing page template, we gated existing content with forms to increase contacts. Once the foundation for content was built through buyer persona profiles, keyword research, and campaign analysis, we decided on the plan for our first content asset––The State of Construction Management Report, which would inform about the current trends and changes in the construction industry and position NoteVault as a thought leader in the industry. The purpose of the content asset was lead generation, but we were able to reap many more benefits from strategically repurposing the content with different objectives. The Survey––We utilized a survey with various questions of industry challenges, successes, concerns, trends, demographics, and opinions. This was shared to current contacts via email campaigns, and then to the public through social channels. Added Benefit: The survey responses allowed us to verify and confirm our buyer persona research and segment current contacts into the updated persona profiles. The Report––With hundreds of compiled responses to the survey, we analyzed the data to identify trends. 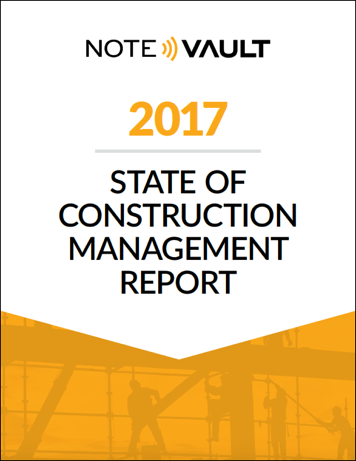 We paired this information with data from NoteVault’s platform to build a full report highlighting the most important stats on the current state and future of construction management. Added Benefit: The report not only generated inbound leads, but also complemented NoteVault’s publicity strategies as they were able to utilize the report in interviews with the media at various industry conferences and events. The Webinar––To push the content even further, we built out an interview-style webinar campaign to discuss the trends uncovered in the report, specifically the trends in construction management technology (something NoteVault just won an award for). Added Benefit: Attendees provided questions and opinions during the webinar that we were later able to repurpose into blog posts, knowing that this was information our audience was actually looking for. 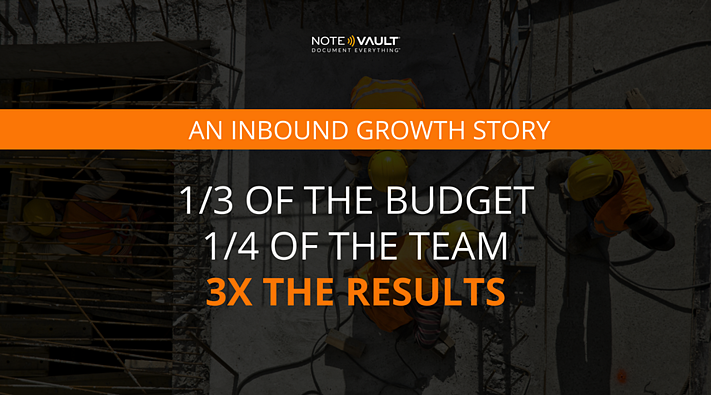 When we first started working with NoteVault, their paid media campaigns were on pause. In order to show the true potential of paid campaigns, we created a more informed ad strategy that solely focused on obtaining more free trial signups each month. After doing an in depth audit of their AdWords account, we made optimizations to account to help us show immediate value of running a paid campaign. Removed all the low performing ad groups, such as Report Template/ Tools/ Data so they wouldn’t drain the budget. As branded ad groups were heavily modified when we started, we paused the low performing ad groups, and created new branded ads that improved the CTR to 11-15% (which naturally reduces the CPC). Fixed conversion tracking, which resulted in the misattribution of leads. As the Google organic and paid URL strings that HubSpot relies on to determine the correct source are very similar, there were constant discrepancies of how leads were being attributed. We started going through conversion time stamps to identify any wrongly marked conversions. Eliminated a lot of the informational related phrases, such as “construction daily report” , replacing them with targeted keywords with more “buying” intent, such as “construction daily log software”. Started split testing days of week, location, and other granular factors that generated a higher quality score, and also gave us relevant clicks. Using these strategies, we decreased the average cost per trial by 32% over the course of a year. Installed leadflows on various pages to capture leads throughout the site. Hüify helped NoteVault successfully hit their goals with a third of the budget and a quarter of the team. We found that what really mattered for NoteVault was attracting and converting the right people. But the most significant change was the shift in culture. The NoteVault team shed their reliance on traditional methods, and were able to see their industry with a new inbound mindset.